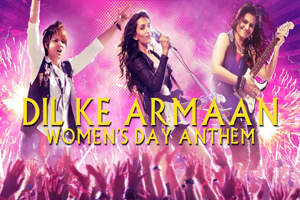 A rock song sung by Neha Bhasin featuring Leeza Mangaldas, Lezlie Tripathy, Sonal Giani. Star Cast: Leeza Mangaldas, Raaj Singh Arora, Lezlie Tripathy, Danish Pandor, Sonal Giani, Meer Ali, Gagan Sharma. The video of this song is available on youtube at the official channel of Sony Music India. This video is of 1 minutes 23 seconds duration. Lyrics of "Dil Ke Armaan (Women's Day Anthem)"
Lyrics in Hindi (Unicode) of "दिल के अरमान (वुमेन्स डे एंथम)"